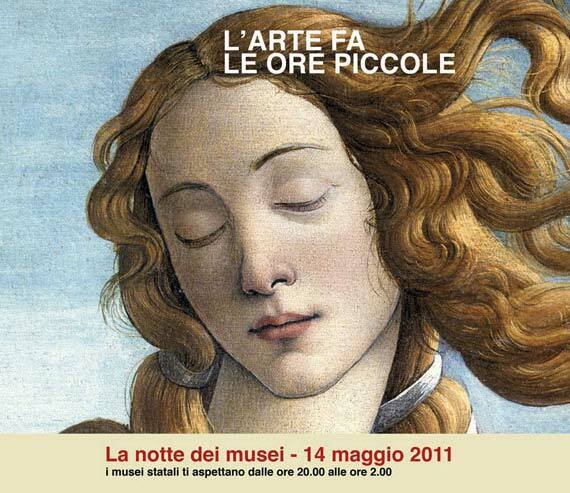 Saturday May 14, 2011 will be the “Night of the Museums”, a special European initiative for which many museums in the various European countries will be open at night offering guided tours and events. The event is sponsored by the UNESCO and the Council of Europe. The Museum of Natural History and Palazzo Vecchio will also offer interesting special events and guided tours. The Museum of Natural History will open with free entrance from 8pm to 12am offering guided tours (held in Italian) every half hour starting from 8pm. On this Saturday night Palazzo Vecchio will also organize special events and will remain open up until 1am. At 9pm in the Sala d ‘Arme a free concert of Renaissance music will be held. Adults and children from 8 years old can participate in free guided tours (held in English) upon reservation. For example, at 7.30pm a visit to the palace “Guided by Giorgio Vasari” will begin, while at the 9pm and 9.45pm one can follow the guided visits to the Salone dei Cinquecento and the ancient patrol path along the battelments. The concert as well as guided tours are free, but availability is limited. Reservation is requested by phone at +39 055 2768 224 or by email to info.museoragazzi@comune.fi.it . After the recent White Night and Blue Night, this is no doubt another extraordinary opportunity to experience Florence until late at night! Have fun! Have the remains of Mona Lisa been found?